When one moves house in Britain the minutiae of the process are soon understood. One needs an estate agent and a solicitor. The agent one uses reluctantly, since they seem to take a lot of money for doing remarkably little; I have found that, having sort-of been in the business, 1% is a usual fee and they will come back to that (from higher quotes) once they understand that you know what it is that they do. The solicitor takes a similar charge and once one understands that they charge by the hour or incident, one tends to contact them only when necessary. Similarly, once contracts are exchanged, the process of reaching completion will usually take two weeks. Making this shorter is like swimming uphill, and letting it drift to a longer period is altogether too easy. The process of moving to a different country is less well understood, unless and until you do it for yourself. In my case, this year, there was far too much included. In committing to migration (a ration of migs) it is difficult to avoid the use of a whole shipping container and that will cost three or four thousand sterling almost irrespective of how much you put into it and where it goes. The insurance on shipping is extraordinary, at between three and four percent, which implies that maybe 2% of container transits fail in some respect, even allowing 100% overhead. This is scary, and discovering the size of the premium suggests in itself that you don’t want the risk. Moving to China has its own hassles. Obviously one needs a visa; obviously one needs a Work Permit. Not so obvious, is that the Work Permit must be raised in China, but you need that same piece of paper to get the visa in Britain. The Chinese say you need the very paper itself, but the embassy in London is happy with a photocopy. Once the visa is achieved, one can travel. Having arrived, one then must obtain a residence permit: I cannot imagine doing this without local assistance, but I can imagine the absolute panic if the residence were to be refused. Application for something must include the possibility of refusal, surely. And, once the residence permit is achieved, then and only then, according to the local information, one can apply for the Import Licence for your belongings – still stuck in Britain, awaiting the requisite paper. Add into this that there is Customs duty to pay on entry, fixed at the value Customs declares (not what you say it is) and you see the immense possibility for corruption at the port of entry. Any slip of the work on the paper and the goods pass into a state of limbo measured in months. Since I suffered the excitement of losing my suitcases in Schiphol when I went out east at Easter, I learned then that, for example, the power lead for the laptop must stay with it (or it is soon useless), that one wants an iron more than any extra item of clothing, that what you take on board needs to be carefully considered; either as little as possible or as near the limit as allowed. This time I have left too much off the boat and have had to pay for air freight for the surplus. Dear DHL (pub quiz types note; Adrian Dalsey. Larry Hillblom & Robert Lynn have been bought out by Deutsche Post) sent my bagpipes at 5kg for £110 and my extra suitcase of 22kg for £280. At effectively £12/kg this is only twice what went by sea and I judge this worthwhile. Altogether more worthwhile, in terms of expense, would be to travel light, to abandon all worldly possessions in Britain and to purchase anew on arrival. In my own case that has been precluded by the perceived demand for textbooks; I procured some 500kg of surplus maths texts from Plymouth College and since this demanded a sea voyage, added all my own gear. And spent a small fortune, which Dipont are being difficult over. In the end, I have spent the same total as if I had bought and sold a house in the UK ¹. Moving all ones goods in turn produces a new problem. If one has migrated, what then does one put as one’s residence in the UK? It seems to be assumed that if you are British, you must have a toehold of possession. I put College House several times before it occurred to me that by the time the address was used by these particular users it would no longer be true. I continued doing so only on figuring that (i) this would cause fewer problems (ii) it is the address used for checking my existence and (iii) wherever the toehold would be transferred to, such as the darling daughter’s residence, the Post Office would sort that out on payment of the appropriate fee. And then there is the car. 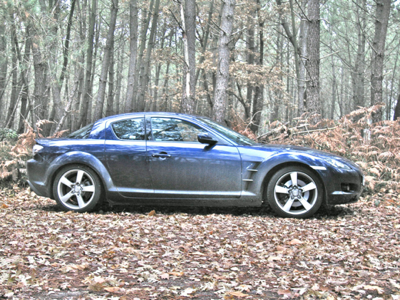 My delicious RX-8 has had to go. Well, it goes extremely well but I have to part with it. Reluctant to do so, I have put off the vile moment for absolutely as long as I can. There are a few websites (webuyanycar.com, sellyourjamjar.co.uk) that allow this. I did some sums and found that the discomfort of being without transport (and therefore hiring), when offset against the loss of receipts in the sale, left me about equal. If you like, the perceived drop in sale value of the car matched what I was prepared to pay for hire, trains and the like; thus, I might as well sell the car this easy way and keep it until the last moment. What is not so clear is that the web-based process gives one an unseen quotation; pretty obviously, this will be argued to some other value when the depot sees the car. I wait to see whether this is a fair trade, and if it is not, then I will leave the car with Jessie for her to sell privately, and for her to pocket the bulk of the difference. My last two weeks in Britain, following Army Camp, involved much travelling. The last Scoins.fest missed out two of the northern branch, so I saw them both briefly, while collecting my bagpipes from restoration in Carlisle². Thence to London to fill in visa application, which I couldn’t do by post as my printer is in transit. Readers will think this silly, but I really couldn’t find a workable solution. As it turned out, being at the office of Chinese Visa Direct in person solved some other issues, gained the answers to some pressing questions and probably saved a cycle of post to Plymouth and therefore another week. I may still have to return to Plymouth College for a mail pick-up (I would still prefer a female pick-up, despite the reputation). Return, because my last week in the country is raised in excitement by an invitation to row in the Town Bumps in Cambridge. Of which, more in this file…. 2 Sadly, while they worked perfectly in Cumbria, they have proved unworkable in China. Whether this is due to the flight or to the humidity here, I have no idea, but they are as unplayable as for the previous thirty years. It could, of course, be performer incompetence.